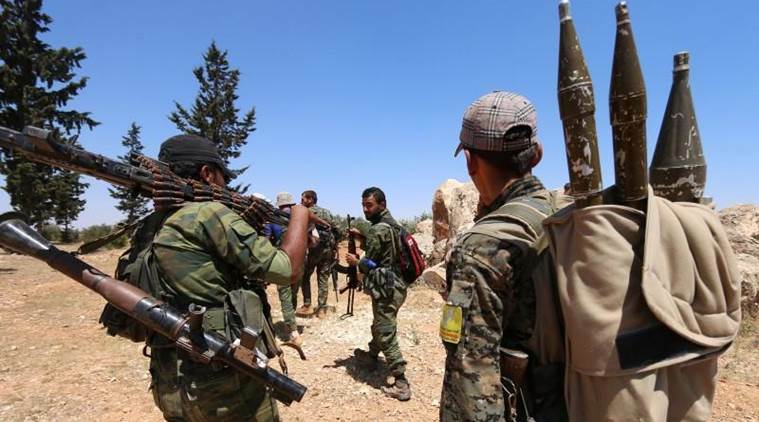 SYRIA: Kurdish-led forces on Friday launched a final assault against diehard militant fighters clinging to the last sliver of their “caliphate” in eastern Syria. The US-backed Syrian Democratic Forces (SDF) said they resumed their advance after plucking a last batch of civilians from the tiny riverside hamlet of Baghouz where militants are holed up. The offensive on a redoubt barely half a square kilometre in size will cap a nearly six-month operation against the Islamic State group’s last bastions in the Euphrates Valley. The “operation to clear the last remaining pocket of ISIS has just started” at 6:00 pm (1600 GMT), SDF spokesperson Mustefa Bali announced on social media, using another acronym for the militants. An unknown number of holdout IS fighters are hunkered down in a small area on the edge of Baghouz for a desperate final stand against the SDF. Bali said the decision to resume the push came after the evacuation of the last civilians willing to leave the enclave and following the release of captured SDF fighters. “The people we evacuated today told us that no civilians were inside and that those still inside did not want to leave,” he told AFP in the nearby base of Al-Omar. “If during the advance we discover that there are still civilians we will isolate them from the fighting but we are forced to push ahead,” he said. He declined to comment on how long the last phase of the offensive might take but the SDF’s general commander Mazloum Kobani said on Thursday he expected final victory to be achieved within a week. An SDF commander told AFP that his force is advancing slowly and with caution because of the threat of underground tunnels and improvised explosive devices. A few dozen people – mostly women, children and elderly men – were evacuated from Baghouz on Friday and trucked to a screening centre. Their number was in sharp decline from the thousands who had been pouring out of the IS-held pocket in recent days. At an SDF screening point 20 kilometres (12 miles) north of Baghouz, an Egyptian woman told AFP that IS was preventing men under 40 from quitting the redoubt, including her 27-year-old husband, ahead of a final battle. Nearby, the SDF patted men down and searched their belongings. With aerial backing from the US-led coalition, IS fighters who have been besieged for weeks are unlikely to resist very long. The offensive will deal a final death blow to the “caliphate” which IS supremo Abu Bakr al-Baghdadi proclaimed in mid-2014 and once covered territory the size of Britain. At its peak, the proto-state covered large parts of Iraq and Syria, minted its own currency, levied taxes and produced its own textbooks. It effectively collapsed in 2017 when IS lost major cities such as Mosul and Raqa following massive offensives from government armies and their respective international allies in both countries. US President Donald Trump, who announced late last year he was pulling troops out of Syria, jumped the gun on declaring victory over the militants. “We just took over,” he said on Thursday in remarks to US service members in Alaska on his way back from Vietnam. While the last remains of IS’s statehood experiment are about to disappear, the group remains a potent force in both Syria and Iraq. Its brutal legacy is still raw and the scope of the atrocities committed under its rule continues to emerge, months and sometimes years after its fighters were defeated. The SDF this week announced that yet another mass grave was discovered, this time near Baghouz and holding the severed heads of women. While the victims were not immediately identified, local fighters believe the executed women are likely to be members of the Yazidi community enslaved by IS. The mostly Iraq-based religious minority are considered heretics by IS, which tried to exterminate them in 2014 with massacres that were among the reasons the United States intervened militarily. Many of the thousands of women abducted by IS then are still missing today and it is feared some may still be held hostage in Baghouz. Nobel laureate Nadia Murad, herself an Iraqi Yazidi who was abducted and raped, urged the coalition backing the SDF to help secure their safe return. “The Global Coalition to Defeat ISIS must have a plan to help rescue Yazidis that are still missing,” she said in a statement on Friday. Some of them managed to slip out with the thousands of civilians who were evacuated over the past 10 days. The Kurdish-run camp of Al-Hol, which has received most new arrivals, is completely overwhelmed. Its population has soared past 50,000 and aid organisations fear dysentery and other diseases could break out, prompting the United Nations to call for urgent funding.